Congratulations to the winners - Donna and Cathy! Helen Hiebert, paper maker, artist, and author (Playing with Pop-Ups is her newest book) recently launched a line of high quality paper crafting kits and will be sending a kit of choice to two U.S. commenters. Each kit would be an ideal project to make prior to the holidays as the results are decor and gift-worthy, not to mention crafty family members and friends would enjoy receiving kits to make on their own during long winter evenings. 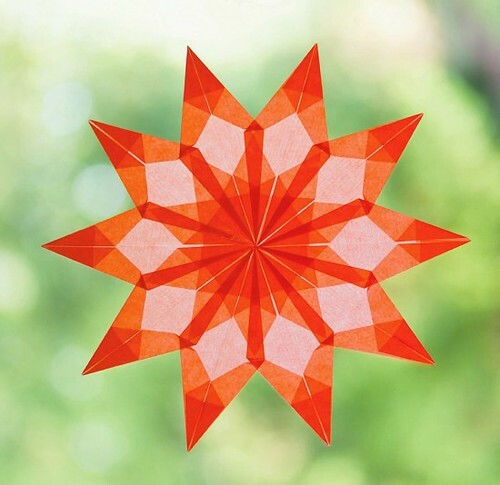 The Window Star Kit comes with enough kite paper to make ten light-catching stars in assorted colors to brighten your windows. They require simple folds and a bit of glue. This project is for ages 8 and up. 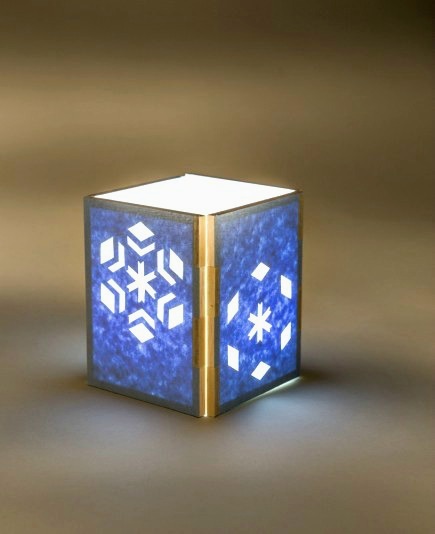 There are three Shadow Lantern Kits to choose from and each is beautiful... Star Lantern, Celtic Knot, and Snowflake. 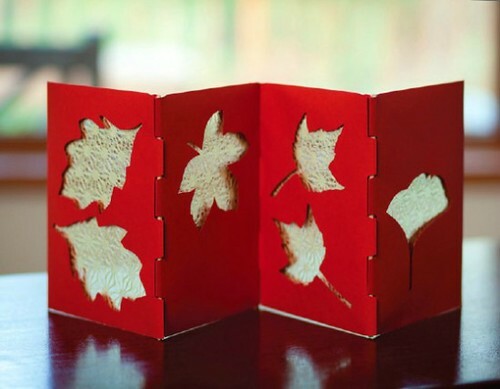 Use a craft knife to cut the design on card stock and back each piece with translucent paper. Balsa wood and paper hinges provide structure and a tea light placed inside casts a shadow. This project is for ages 15 and up. The Shadow Ornament Kit was inspired by Japanese shoji screens that divide living spaces while adding to their ambiance. It features a pre-punched design. This project is for ages 10 and up. 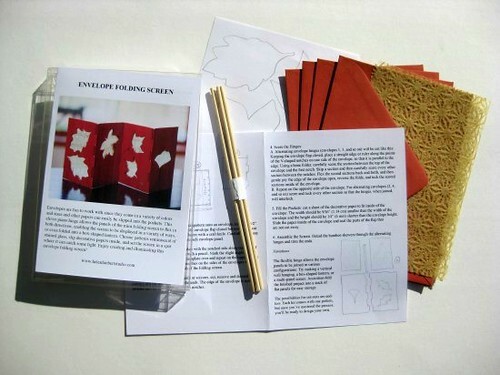 The Envelope Folding Screen Kit utilizes paper cutting and bamboo skewer/paper piano hinges that flex both ways. 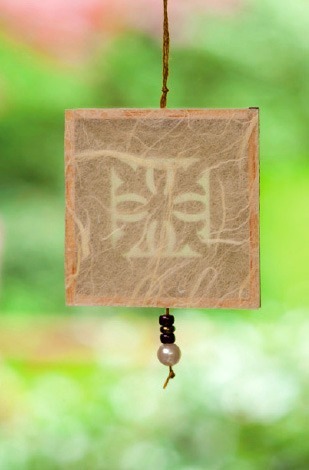 This makes it possible to not only use the screen as an eye-catching display object with a light source placed behind it, but also as a four-sided lantern. Decorative paper is slipped inside each envelope. This project is for ages 13 and up. Unique supplies and text/diagram instructions are included... I love the convenience of kits! 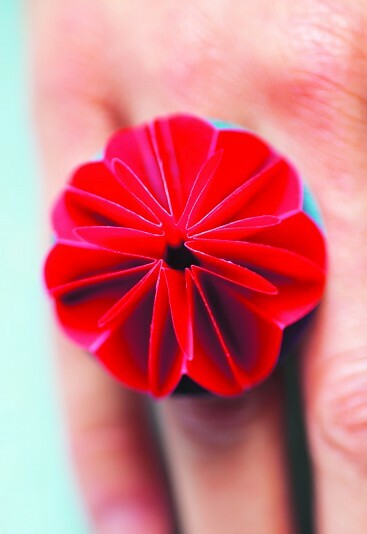 The Interchangeable Ring Kit features a simple origami fold that results in a 3D vellum topper held in place by a slim magnet on a metal ring base. This project is for ages 10 and up. 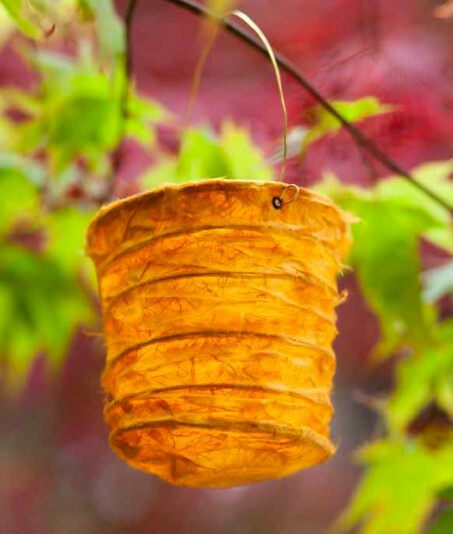 You'll use collage paper, basket reed and wire to make this Party Light that can be hung or placed on a table. This project is for ages 10 and up. Helen will be sending a kit of choice to two winners in the U.S. Just choose your favorite and name it in your comment as your entry through Sunday, November 16, 2014 (visit the kit page to learn more about each one). Be sure to include an email address within your comment so I can contact you, as Blogger does not allow me to see the top portion of the form. Winners will be selected by a random number generator and announced on this post when both have been notified. Good luck! Love the colors and design in the Envelope Folding Screen Kit! I would love to work on any of these kits I have to say the Shadow Lantern Kit with the Celtic Knot. These are all so beautiful, thank you. I really like the Shadow Ornament Kit. Looks like fun. They are all nice so any one would be great. I would choose the Shadow Ornament Kit. Love the folding screen kit. These are fun! I like the Window Star Kit. Like the window star kit. Although they are all very wonderful looking kits. These would be fun for my grand-kids too. Lovely, lovely paper things! hrhdeanne at yahoo dot com. Thanks! I like the Snowflake Shadow Lantern Kit. My favorite is the envelope folding screen...and the snowflake lantern. They are all lovely! Thanks for the chance to win one! I love the screen projects. I would like to make the snowflake one for a family celebrations. Thanks for your creations! I love them all. But I'd choose the Paper Basket kit. Baskets can be used for so many things. They are all lovely projects. Thanks for the chance to enter. I love these! I think the ring is my favorite. What a cute idea. 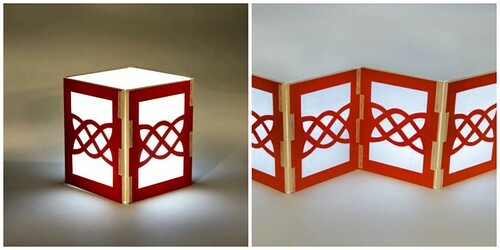 The celtic knot shadow lantern kit is beautiful! I like them all, but the one that stands out for me is the "window star". Imagine making this in white with pale blue or gold and silver accents. Pretty, pretty !!! The Window Star kit looks so colorful and cheerful. It would be my choice. I love the Celtic Knot Shadow Lantern Kit. Would love to try out the Window Star and the Celtic knot kits. I love the Window Star Kit. They are all great..
ANY of these kits would be an honor to receive!!!! What great projects! I would love the envelope folding screen. The hinge seems like I could figure it out, but it would be great to have the kit. Thanks for the offer. Yes, I misspelled my email address. So, another post from the dithery old lady Kate: cloudykate at gmail.com. Sorry for the clutter. I love all of these kits. If I had to choose. I think I would like the window star kit, but they are all beautiful. The celtic knot one is beautiful also. Whoops, forgot my email address. My favorite is the snowflake lantern if Ireally have to choose as I enjoy them all. Would love the hanging lantern ! 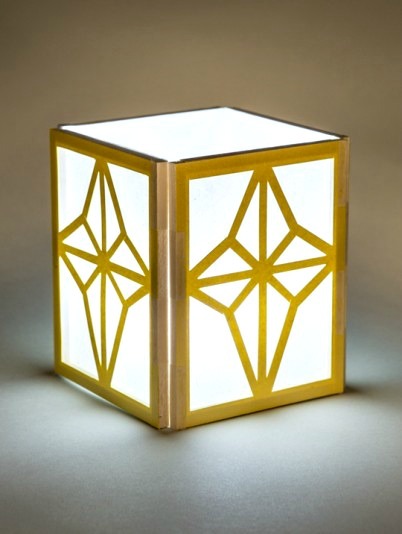 Your lovely Celtic Knot shadow lantern kit is my favorite, but the window stars are a close second. shirleyj123@sbcglobal.net Thanks for the chance to win, for sharing your remarkable art and for The Sunday Paper that has introduced me to so many wonderful artists! And I like the folding envelope screen with those piano hinges that fold either way and can connect to become a lantern. Plus the bucket party light that could be done in different sizes and with silhouettes pasted on randomly to make interesting patterns. For my deck on summer nights. Thanks, Helen!. I love the folding envelope screen kit, it is interesting that it folds 2 ways. Lovely kits. Love the Envelope Folding Screen Kit! I really like the idea that you can use items you have at home to make this screen and stick a non-flammable tea-light behind it and you are in the romance business! And if you make it into a lantern you could wire it up top to hang some place and at the bottom to support a tea-light. Talk about ambiance without burning down the house!! The giveaway has ended. Thanks for your entries!